Medium long cylindrical fruit, shining attractive green color, cluster bearing, good vigorous, maturity time is 60 days, tolerant to major disease. Good Hybrid early variety Plant bushy erect dwarf many branches days to first harvest 45-50 days after Transplanting fruits attractive glossy dark purple black round spineless calyx green small fruits 80-100 g. borne in cluster good shelf life. 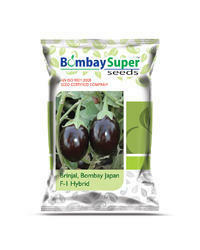 We are a renowned name that is actively committed towards offering qualitative Hybrid Brinjal Green Long Seeds. Our provided Hybrid Brinjal Green Long Seed is available in various packaging options for our clients. - Harvest 55-60 days after transplanting. The hybrid Brinjal Seed-amar is ready to harvest within 70-75 days of transplanting. The fruits so produced are thorn less, light green in color, cylindrical and 6-9 inches long. The Brinjal-Amar is suitable for cultivation in all seasons and is hugely demanded in hotels, malls and local & super markets. Brinjal is available in both OP & HYBRID Variety, you can leave us a message or contact us for wholesale rates. With a main aim to accomplish high level of patron trust, we have been engrossed in providing a vast assortment of Brinjal Seed.We will give discount on the order above 1 Kg.